Christophe Claret Soprano: a tourbillon music!After Adagio Christophe Claret Soprano continues to declare his love for the minute repeater. 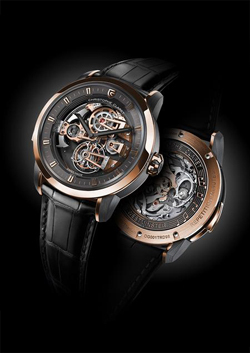 Christophe Claret Soprano: a tourbillon music! 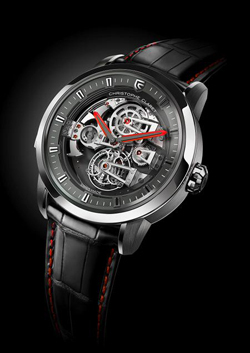 After Adagio Christophe Claret Soprano continues to declare his love for the minute repeater. 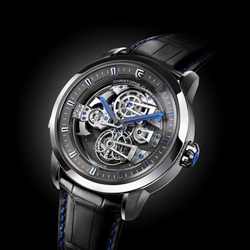 Indeed, because each new timepiece Haute Horlogerie also represents a new challenge, he arranged for the occasion that the chimes avvenissero with Westminster chime (same tune of Big Ben), with four stamps patented orchestrated by four hammers come first floor of a structure bridges overlapping style Charles X supporting a tourbillon. Soprano, in agreement with the watchmaking Claret is full of tradition always played by innovative solutions and materials. His case combines titanium noble metals. A master watchmaker is a mixture of knowledge, passion, and knowledge of art history. Fascinated by both the mechanics as aesthetics, our was guided to it from the time when Charles X was the King of France. Six years, from 1824 to 1830, a very short period which did not fail, however, to influence the decorative arts, and consequently the watches of the time. “This I have always loved the style Charles X, which is very rich, and the side of the building architectural movements. Already at that time, there was only concerned technical perfection, but also aesthetics and balance. All this inspires me a lot. Soprano in the watch that we present this autumn, I drew inspiration largely from the decks stacked emblematic of this period, to reinterpret them in a contemporary way, “says Christophe Claret. Should be noted that this is not the first time that the watchmaker’s hand is guided by these forms. In order to confirm what he has always been innovative, already in 1997, mastered by creating, for the first time ever, a tourbillon watch with sapphire plate and bridges. This is just as, if not more, amazing. The complicated movement with manual winding tourbillon and minute repeater, it requires a lot of energy: two barrels gliel’assicurano for 72 hours. The tourbillon 60 seconds, positioned at 6 o’clock, are perhaps the only specific “standard” Soprano. The regulatory mechanism is supported by a structure of overlapping bridges and pierced style Charles X. The minute repeater mechanism by which a watch “speaks”, or perhaps I should say “singing”, is a mechanism developed ten years ago by the master for the occasion redone from scratch. Thanks to the absence of the dial, as well as crystal clear sound that four hammers singing the “Westminster Chime” are able to return, you can see them while they are at work. Care in obtaining the purest possible sound, look always on top for those who like Claret has a penchant for the minute repeater, involved in drawn steel stamps and their tuning. “For most of the notes close as possible to our world of sound, we turned to a piano maker of Neuchatel. With him, we worked on a specific software, which allows to determine the exact frequency, close to 5 Hz, the time stamp of each tuning. Then, it is obtained by filing the base of the stamp, or adjusting the length, “says proud Claret. Regarding the first, the case of the Soprano is 45 mm and 15.32 mm thick, classic and round. I would say that the use is still acceptable compromise. For materials instead must take a different matter. 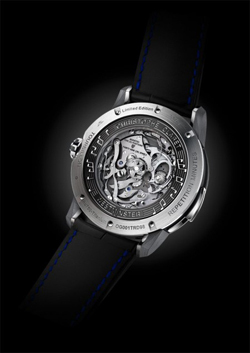 Francois-Paul Journe, for example, in its repetition minute show not to any compromise. Both Repetition Souveraine that even the most Sonnerie Souveraine (the latter costs more than € 600,000), uses steel in what he says is the material that gives the best sound. Claret for cash instead uses titanium and gold, he said two metals with a perfect resonance. Stamps in Westminster (or cathedral) are approximately twice the diameter of the case. For the noise they use a patented invention by Claret that averts the risk of vibrations which would interfere with the purity of the sound. As in DualTow, one of the dots watchmaker is the “transparency”, all the mechanics must be visible or glimpse as much as possible. The Soprano is true for the dynamic elements such as four hammers, the regulator of minute repeater visible at 9 o’clock, cams, wheels, tourbillon, and finally to the static elements such as the structure of the bridges overlapping style Charles X. In the details stand out color combinations, glass sapphire normal and soft. The back of the watch, completely perforated, shows both the details of the movement, is a ring-shaped engraved musical stave, on which are engraved some notes.